Stems: Erect, to loosely ascending, solitary or more commonly paired to few, glabrous below inflorescence, sparsely hairy in inflorescence. Leaves: Alternate, numerous, thin, 1 to 6 inches long, .2 to 2 inches wide; upper surface often rough; lower surface with 1 main vein; margins toothed; tip pointed; short-stalked to nearly sessile; basal and mid-stem leaves often withering by flowering; basal leaves elliptic to narrowly obovate, abruptly contracted to stalk; mid-stem leaves ovate-lanceolate to lanceolate; upper leaves reduced, bract-like beneath inflorescence, elliptic to narrowly lanceolate, margins entire. Inflorescences: Panicle-like, open, somewhat pyramidal, terminal; branches few, often long, widely spaced, arching or nodding; heads 20-150, crowded, directed upward along one side of branch; involucre 1/10 to 1/5 inch tall; bracts unequal, overlapping in 2-4 series; outer bracts ovate, pointed; inner bracts linear-lanceolate, bluntly to sharply pointed; margins thin, white to yellowish-white near tip, center green. 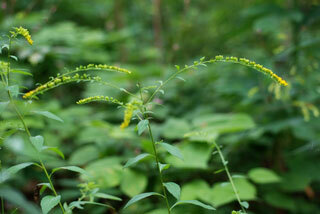 Flowers: Ray florets 3-5, 1/25 to 1/12 inch long, yellow; disk florets 4-7, 1/10 to 1/3 inch long, yellow. Fruits: Achene, finely-hairy, ribbed, tipped by numerous white bristles, enclosing small seed. Habitat: Dry or drying, open rocky woods, particularly along stream banks and bluffs, pond margins, old fields, pastures, roadsides; sandy or rocky soils. Uses: Native Americans would revive someone who was unconscious with the smoke of the smouldering plant.